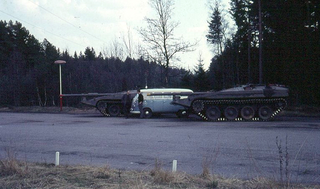 The Strv 103-0 is a Swedish tier 9 tank destroyer. A contract for the production of a turretless vehicle was concluded with the Bofors company in 1960. A total of 10 prototypes of the "zero series" were produced. The vehicles differed from the mass-produced Strv 103 in weaker armor and engine, as well as in the commander's cupola. 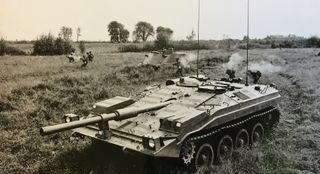 In 1964, the vehicles were used as a basis for the Strv 103A production. The Strv 103-0 is a vast improvement over the UDES 03. It offers much more reliable protection than its predecessor. Its stock gun is carried over from the UDES 03, and it also shares its top gun with its brother; the Strv 103B. Both guns provide fantastic penetration and alpha, with great rate of fire. Although it is much easier to maneuver, it still suffers from the downside of a hydraulic suspension. It also has horrible gun handling in travel mode and horrible mobility in siege mode. If played correctly, the Strv 103-0 is an impressive tank hunter that will unleash death upon its enemies. It prepares you for an even more impressive tank hunter: Strv 103B. The Strv 103-0 leads to the Strv 103B. - Highest penetration of all tier 9 tanks both on stock gun (288) and top gun (308). - Good mobility and traverse speed, especially in rough terrain. - High reverse speed (45 km/h). It is almost the same as the forward speed (50 km/h). In combination with great sloped armour, you can reverse escape which makes you less vulnerable to enemy fire. - Lowest HP pool for non-SPGs vehicles on the same tier (1500). - Despite having high nominal penetration, your shots will bounce often when shooting even slightly angled armor at this tier, due to APCR rounds having lower normalization that AP. - Very long aim time in travel mode on both guns, as well as no horizontal gun movement, which forces you to move to shoot new targets, and greatly lose accuracy while doing so. - Expensive repair cost makes it easy to lose money. - Guns with calibre above 120mm (many Russian/Chinese/Japanese vehicles) will overmatch your armor easily. - HEAT ammo, even from lower calibre guns, can penetrate you due to higher autobounce threshold required compared to AP or APCR. You barely need any research for the Strv 103-0. The stock gun already has the best-in-tier penetration, good ROF and damage. Upgrading from L/51 to L/62 adds a buff in penetration (288 -> 308) and a minor buff to the shell velocity (1450 m/s -> 1500 m/s). But the stock tracks can't even take the weight of all 3 equipments. You can take Binocular Telescope, but you will have to choose between Gun Rammer or Camouflage Net until you upgrade the tracks. Since the ROF is already great, using Camouflage Net to keep being hidden is the better choice. You have to research the tracks first, then research the gun before the engine, considering the 288 penetration could be a bit underwhelming against tier 10 superheavies such as Maus or E-100. Also, the tank is already quite mobile and it is only really effective in siege mode (which is mostly stationary), so you won't miss having a less powerful engine while you penetrate most of your shots in siege mode. In the mid-1950s, the Kungliga Arméförvaltningens Tygavdelning put out a contract tender for next generation tank design to replace their Centurions. A consortium of Landsverk, Volvo and Bofors responded with a suggestion to revive an earlier domestic heavy tank design, known under the codename KRV, fitted with a 155 mm smoothbore gun in an oscillating turret. However, this was deemed too expensive in comparison to the alternatives: A(ngloamerican), which was to purchase a 50-ton tank with high protection and mediocre mobility from either U.K. or U.S.A. Alternative T(ysk-fransk /German-French) was a 30-ton tank with low protection and good mobility. Then, in 1956, Sven Berge of the Swedish Arms Administration proposed Alternativ S, a domestic alternative (S standing for Swedish). In preparation for the defence decision of 1958 (Försvarsbeslut 1958 (FB58)) in the Swedish parliament (Riksdagen), the procurement set Alternativ S against the two foreign alternatives Alternativ A and Alternativ T. While the domestic alternative was going to be more expensive, the defence committee report recommended "S" when weighing in the symbolic value of a domestic tank for a neutral country as well as the spin-off effects on Swedish industrial competence. Riksdagen made the formal decision regarding FB58 on 4 February 1958, and a follow-on contract called for two production prototypes, which were completed in 1961. By this point, the army was so satisfied with the design that an initial pre-production order for 10 was placed in 1960. With minor changes, the Alternativ S was adopted as the Stridsvagn 103 ("103" from being the third tank with a 10 cm calibre gun accepted into Swedish service). In 1963, a batch of pre-production vehicles was built. It was called the 0-series and would more closely resemble the planned production version. 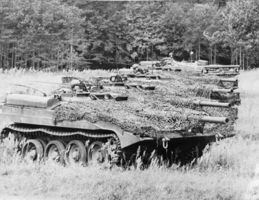 These were used for series of tests of everything – from different engine options to trials with built-in dozer blades and different types of armament. Pherhaps most important was that they were used for tests, involving collaboration with infantry and other units. As a part of these tests, the armament was changed from the British L7 gun to a longer version of it, which offered higher muzzle velocity and penetration. In addition, the commander’s cupola was developed into one of the best designs in the world, which has proven itself since by outperforming everything from the Leopard 1 and Centurion to the Chieftain and in one case, even the Leopard 2 in various tests around the world. The only major difference between the pre-production models and the final production version was the older design of commander’s cupola and the lack of ribbed armor. As a part of the testing of the 0-series, there was a research into how to improve the frontal armor. Originally the armor was 40mm thick, but tests were being made with 50mm plates as well as a new type of “ribbed” armor. It was found that this “ribbed” armor, consisting of 40mm tall and 30mm wide metal bars welded onto a 40mm plate, was much less prone to deforming and as a bonus, these ribs added a sort of spaced armor effect, where a round was much less likely to penetrate the main armor plate. On the production version, these plates were used for the front of the vehicle to cover the engine compartment. This page was last modified on 30 January 2019, at 08:59.